The ACT consists of curriculum-based tests of educational development in English, mathematics, reading, and science designed to measure the skills needed for success in first year college coursework. 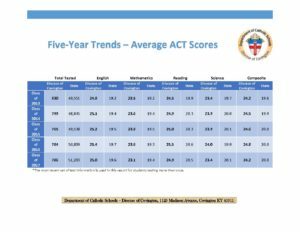 The data represented in the image above, reflects the achievements of our graduates on the ACT over a five year period. ACT uses the most recent ACT score of each of our graduated students to total the class averages. Beginning with the 2013 Graduating Class, all students whose scores are college reportable, both standard and extended time, are now included in this report. If you would like more information about the ACT scores for a particular high school, please contact the school directly.